A coronation is the act of placement or bestowal of a crown upon a monarch's head. The term generally also refers not only to the physical crowning but to the whole ceremony wherein the act of crowning occurs, along with the presentation of other items of regalia, marking the formal investiture of a monarch with regal power. The City bought this land in 1906, but it lay undeveloped for many years. Initially called Westmount Park, or West End City Park, the name was changed in 1953 to mark the coronation of Queen Elizabeth II. An elm tree was planted in the 35.41-ha. Woodcroft neighbourhood park to mark its official naming and dedication. Confederation: a union of sovereign states, united for purposes of common action often in relation to other states. This 10.72-ha. park, in the Royal Gardens neighbourhood, commemorates the 1967 centenary of Canada's confederation. It was established with the cooperation of the Public School Board, the Separate School Board and the City of Edmonton Parks and Recreation Department. Clover: English, perhaps a variant of Cleaver, from a derivative of Old English clēofan ‘to split’, with change of stress within the diphthong to cleōfan, cloven, whence Clover. Dale, Old English meaning ‘place in the valley’. Cloverdale was named for the Clover Bar Road, which ran from this neighbourhood to Clover Bar. Clover Bar and Cloverdale are named after Thomas H. Clover, a pioneer who mined the North Saskatchewan for gold. The neighbourhood was originally called Gallagher Flats, after the landowner Cornelius Gallagher, who owned a meat store and was later a mayor of Edmonton. The name Cloverdale seems to have emerged in the 1930s. For instance, the local Bennett School Community League was renamed the Cloverdale Community League in 1934. Both Cloverdale and Gallagher Flats were used to refer to the district until the 1950s, when the name Cloverdale was used on maps and in the Henderson's Greater Edmonton Directory. This road was commonly referred to by several names, including Cloverdale Road, Cloverdale Hill Road and Cloverdale Hill. In 1973 Cloverdale Hill was recognized as the official name. Feature Type (Year Approved): Area (common usage), Cemetery (1995), Neighbourhood (1982). English: perhaps a variant of Cleaver, from a derivative of Old English clēofan ‘to split’, with change of stress within the diphthong to cleōfan, cloven, whence Clover. Barr, Celtic for ‘hill top’. Thomas H. Clover (b. 1829) was a California "forty-niner," a veteran of the California gold rush of 1849, who mined gold from sandbars along the North Saskatchewan River. He was born in Missouri and is believed to have arrived in the area around 1859. It would be many years, however, before Clover Bar was settled by European homesteaders. Beginning in 1881, the rich farming land and the discovery of coal drew settlers to the area. The Clover Bar name was in use before 1900, evidenced by the establishment of the Clover Bar Post Office in 1884 and the Clover Bar School District in 1891. Work on the Clover Bar Bridge started in 1951 but was halted a year later because of a shortage of steel. Construction resumed months later and the superstructure was completed in March 1953. This bridge was informally known as the Beverly Bridge, a name later officially given to its twin. The Clover Bar Bridge carries westbound traffic on the Yellowhead Trail. Clover Bar Cemetery was established in 1901 behind the Clover Bar Church, which had been built in 1899. Homesteader W.F. Wilkinson donated his land for the cemetery, and he and nine other local residents formed a cemetery company. Originally surrounded by countryside, the cemetery has an area of 1.21 ha. The City took over management of the facility in 1995. Prior to annexation, this name was established through common usage. This road, overlooking the Groat Ravine, has been in existence since around 1935. The name may refer to the road's cliff-top location. Irish: from Clare in Suffolk (not the Irish county). English: relationship name from the Middle English, Old French female personal name Cla(i)re (Latin Clara, from clarus ‘bright, famous’), noted as the name of Saint Clare of Assisi. English: occupational name from an agent derivative of Middle English cley ‘clay’. Francis C. Clare (d. 1941), an important spokesperson for agriculture, farmed in this vicinity from 1906 to 1959. In 1914 he sued the City and obtained a court judgement restraining the City of Edmonton from increasing its deposits of sewage in the North Saskatchewan River. The City was at that time dumping unfiltered waste water into the river, making it impossible for Clare to water his dairy cows. The judgement also ordered the City to construct a sewage treatment plant. Clare was a member of the United Grain Growers Board, Edmonton Exhibition Board, United Farmers of Alberta and the local school board. Many of the neighbourhoods in this subdivision are named after Edmonton pioneers, including Bannerman, Fraser, Kernohan and Kirkness. This neighbourhood is a component of a development plan formulated in 1979, but never implemented. Known as Clareview Town Centre, it had two parts. This portion would provide space for business ventures, while the adjacent Clareview Campus neighbourhood would be devoted to school and recreational facilities. The Clareview Town Centre name has largely been replaced in popular usage by Clareview Business Park and Clareview Campus, despite the lack of development. English: locative name from any of the many places called Churchill or Church Hill, for example in Somerset, Devon, Oxon, and Worcs, or alternatively a topographic name denoting someone who lived ‘(on the) church hill’. Sir Winston Churchill (1874-1965) was one of the most important figures of the 20th century. As prime minister of Great Britain during WWII, he led the allied campaign against Nazi Germany and the Axis powers. Churchill Crescent, in the Glenora neighbourhood, was originally two numbered streets. It was in 1941, during WWII, that residents petitioned the City to join the two streets and name the new street after the British prime minister. English, Scottish: nickname, locative name from Middle English chirie, cherye ‘cherry’, probably denoting a grower or seller of cherries or someone who lived near a cherry tree. At the turn of the 20th century, the district where this park is located was known as Cherrydale. The name Cherrydale Park was chosen for this 2.81-ha. park, in the Kildare neighbourhood, through a naming contest sponsored by the Londonderry Colloquium, a northeast Edmonton community newspaper. Mary Ostapiw won a $25 prize for her winning entry. Name Origins: Descriptive Land Feature (possibly from the chokecherries common to the area). Cherry, from Middle English, chiri. Grove, from Old English, ‘place at the grove or coppiced wood’. A common name. This crescent, located in the Mayliewan neighbourhood, takes its name from the Cherry Grove subdivision, which existed here in the early 1900s. The original owners of the land were George and Elizabeth Cresswell, who settled it in 1905. They originally planned to subdivide their property. The crash of Edmonton's real estate market in 1913, however, bankrupted many land speculators and brought the city's remarkable pre-WWI growth to a halt. The city would not see a boom in the land market again until after WWII. Because of this, many of the neighbourhoods that had been subdivided and named in the first decade of the twentieth century remained farmland and were not developed until well after the 1950s. The Cresswell family continued to farm here until the 1970s, when the land was finally developed for residential use. It is possible that chokecherries, which are native to this region, are the source of this name. English: locative name from Cheriton Fitzpaine, Cheriton Bishop, or Cheriton in Bredon (all Devon). ‘village with a church’ from Old English. Edith Muriel Cheriton was one of the first women to graduate from the University of Alberta Faculty of Engineering. Cheriton, born and raised in Edmonton, graduated with a Bachelor of Science degree in Electrical Engineering in 1946. She went on to work for Calgary Power and later accepted a post with Canadian General Electric in Toronto. In 1963, Cheriton and her husband established an engineering consulting firm in Edmonton. Please see the previous entry ‘Charles Anderson’ for the name ‘Charles’. English: relationship name from the common Middle English personal name Simon. English-born Charles Simmonds (1893-1962) was an alderman and long-serving president of the Edmonton Federation of Community Leagues. Before emigrating to Canada in 1921, Simmonds served as a major in the British Army during WWI and was awarded the Military Cross. After moving to Edmonton in 1934, he became an active member of the community, serving on city council as an alderman from 1954 to 1955 and filling the post of president of the Edmonton Federation of Community Leagues 13 times. The Charles Simmonds Park is in the Belgravia neighbourhood and has an area of 1.53 ha. See previous entry, Charles Anderson, for ‘Charles’. English: locative name from Middle English hill, hell, hull ‘hill’ (Old English hyll). English: relationship name; in some cases, possibly, from a personal name Hille, a pet form of some such name as Hilger or Hillary. Charles B. Hill (1891-1972) was a child welfare worker for more than 40 years. Over this period, "Uncle Charlie" supervised the adoption of more than 20,000 babies. Hill was born in England and began his career in the English Poor Law service. He came to Canada in 1910 and began working for the provincial government in 1915, first as a welfare inspector, then as chief clerk for the department. He was named child placement officer in 1923, deputy of child welfare in 1940, and became superintendent in 1944, retiring from this post in 1956. The Charles B. Hill Park is in the Hillview neighbourhood and has an area of 0.41 ha. English: relationship name from the Middle English, Old French personal name Charles, derived from Carolus, a latinization of Continental Germanic Karl. Huguenot (French): relationship name from French Charles, with the same origin as above. Scottish, English: relationship name from Andrew + -son. Scottish-born Charles Anderson (b. 1901) was a pioneer railroad man who came to Edmonton in 1911. He delivered newspapers for the Edmonton Journal before being hired as a chainman for the Grand Trunk Pacific Railway Company (GTP) in 1918. In 1923 the GTP was amalgamated with the Canadian National Railways and Anderson went to work in the accounting department of the Alberta and Great Waterways Railway (A & GW). He later became chief clerk with the Alberta government-owned Edmonton, Dunvegan and British Columbia (ED & BC) Railway. In 1928 this railway merged with the A & GW, the Canada Central Railway and the Pembina Valley Railway to form the Northern Alberta Railways (NAR). By 1950 Anderson was the NAR's chief accounting and finance officer. He retired in 1967 but returned to work four years later as director and then managing director of the Alberta Resources Railway. He continued working until 1995 when, at the age of 94, he retired for the second and last time. In 1996 he was appointed a member of the Order of Canada for his contributions to industry, commerce and business. Anderson celebrated his 100th birthday in 2001. The Charles Anderson Park is in the Duggan neighbourhood and has an area of 2.05 ha. The town known as Lemencum first changed its name in the Middle Ages during the period that the Duc de Savoie erected his castle. It was called Camefriacum in 1016, Camberiaco in 1029, Cambariacum in 1036, and Cambariaco in 1044. In the next century, Cambariaco changed to Chamberium (1233), finally becoming Chamberi in 1603. The actual name supposedly comes from the Gaulois term camboritos (a ford situated in a curve). The Latin name cambarius, meaning beer brewer, may also explain the name. Another hypothesis is that the Gallo-Roman name Camberiacum suggests the idea of currency changing (cambium) or trade (camerinum : market), or perhaps, a room (camera) where the toll taxes are collected. From the Wikipedia entry for Chambery. Castle Chambery in 1645, from Wikipedia article for Chambery. As with other neighbourhoods in the Castle Downs area, the name Chambery is taken from a famous castle. 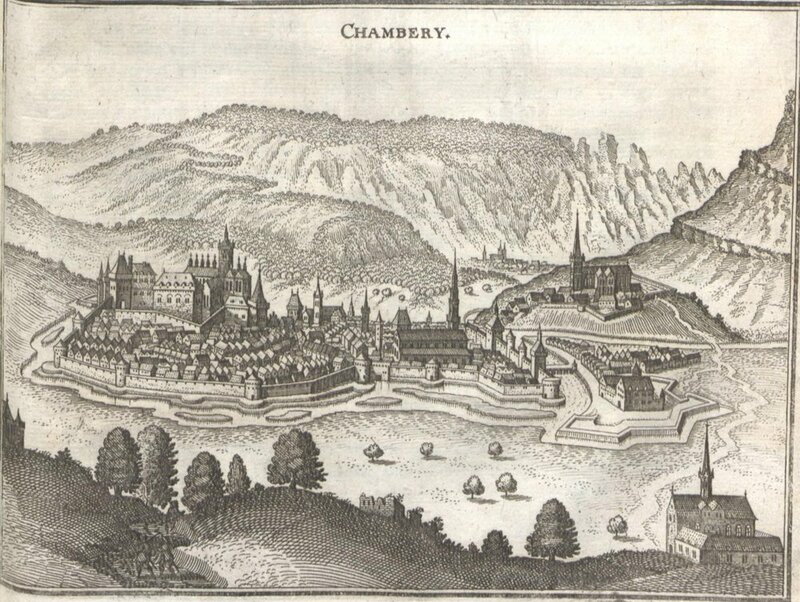 The original Chambery castle was founded in 1232 and served as the capital of the mountain Duchy of Savoy until the sixteenth century. In 1860 Savoy became part of France. The ancient ducal castle, restored many times, still stands today. Scottish: occupational name from Older Scots chalmer ‘chamberlain’. This park is named after Chalmers Church, the well-known Calder community landmark. The name was chosen through a public contest organized by the Calder Action Committee. This church was named in honour of Thomas Chalmers (1780-1847), a leading Scottish theologian, philosopher, mathematician and moderator of the Free Church of Scotland. Many churches around the world bear his name. Chalmers Church in Edmonton dates back to 1911, when the first service was held in an Oddfellows Hall. Chalmers Park is in the Calder neighbourhood and has an area of 0.45 ha.